result of each firing is always a surprise. luster bowl. “I have never gotten anything like those before. late Vivika Heino, well known for her mastery of glaze chemistry. of the most significant incidents that shaped his creative development. and notes from the late Richard Behrens, an expert in glaze research. young career occurred when he came across a copy of Cullin W.
Haggerty is an enthusiastic admirer of the work of Gertrude and Otto Natzler, who are known for their highly crafted forms and remarkable glazes. He studied their work as well as the work of Beatrice Wood, in hopes of learning about their techniques and materials, but found very little information. “Out of their kilns came surfaces and textures that I’d never seen before that just amazed me,” he recalled. “I realized that if I was ever going to figure out how it was done, I would have to do it on my own. 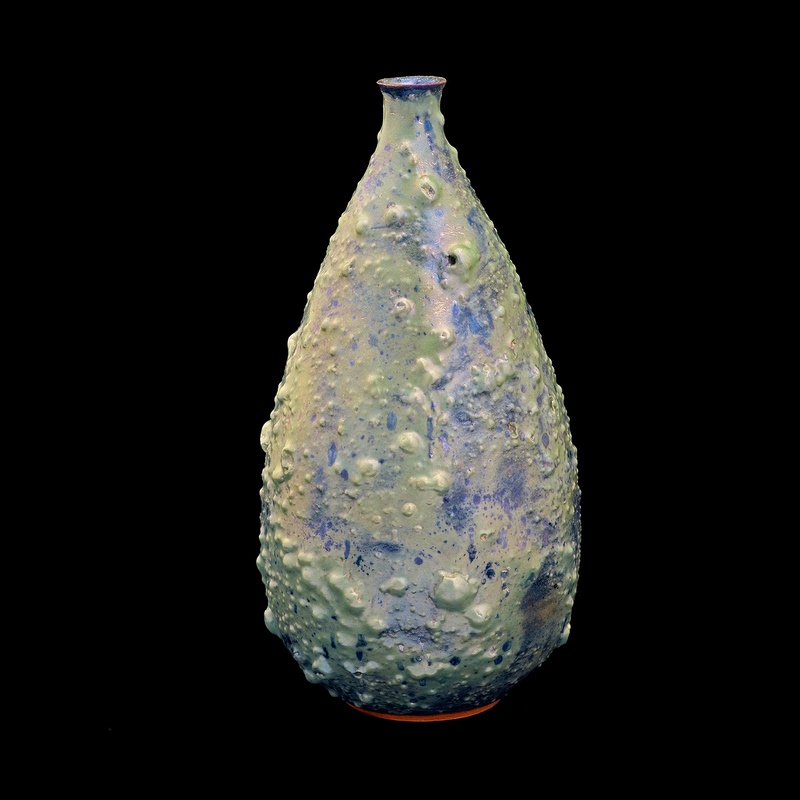 So I continuously adjusted the firing, the temperature and used a variety of materials in the glazes. I introduced combustible materials, such as leaves and wood, into the kiln at various stages during the firing. After two years of testing, he had a palette that was diverse in both color and texture. the kiln until it is dark. open. Then the damper was closed and 5–7 lbs of eucalyptus wood was inserted. “Gold Ruckled Crater Bowl,” 13 inches (33 centimeters) in height, with Crater Underglaze, then Top Crater Glaze was applied with an addition of 7% manganese dioxide and 2% copper carbonate. “I draw much of my inspiration from the nature that surrounds me in California—the diverse plant life and geological formations have always fascinated me,”Haggerty states. by James Haggerty, Santa Barbara, California.